2 Bedroom Semi Detached Bungalow For Sale in Nantwich for Offers Over £270,000. Looking for a stunning bungalow close to Nantwich town centre? 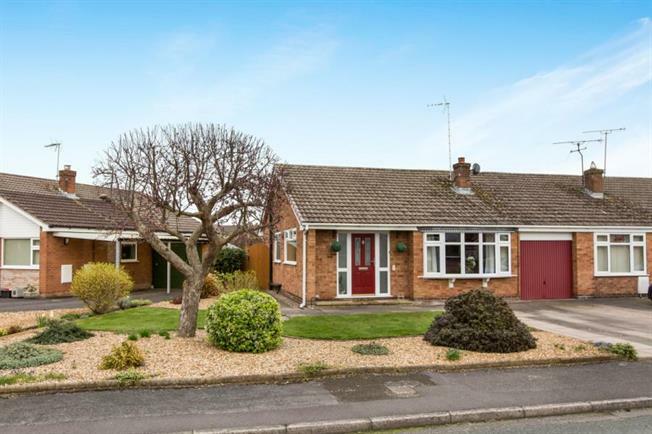 This semi detached bungalow is immaculate and well presented throughout. The accommodation comprises of a hallway tiled floor and cloaks. Lounge with stone fireplace, gas fire and bay window. Stunning modern kitchen with integrated fridge/freezer/double oven, induction hob and extractor fan and tiled floor. Open plan through to dining room and gorgeous heated conservatory, all with tiled floors. The conservatory also benefits from a bespoke oak cabinet, used to house a washing machine. There are two bedrooms, one double and one a good sized single. The modern bathroom is fully tiled with corner shower, vanity sink unit and chrome heated ladder. The bungalow sits in a large plot with lovely low maintenance landscaped gardens, a driveway for two cars and garage. The rear garden also benefits from a wooden cabin approx. 12" x 10" with electricity. There is also ample room to extend or convert the garage subject to planning. Viewing essential to appreciate this beautifully updated and maintained home.